Toyota 'Two Worlds' features the 2012 Camry traversing a stretch of road that literally depicts two worlds-one that is light called 'eco-friendly,' the other darker and sportier called 'performance-driven.' From agency Saatchi & Saatchi LA and director Phil Joanou, the captivating spot takes viewers on a ride through the hybrid landscape. Wild mustangs, hang gliders, motorcycles and fighter jets are among the spot's visual eye candy. The Mill's team crafted VFX for 'Two Worlds,' as well as two other commercials in the 'It's Ready. Are You?' campaign: 'Built,' featuring the reinvented Camry being created from scratch to accommodate the protagonist's every whim; and 'Crew,' an entertaining look at the Camry's Entune system with mobile app offerings represented by celebrities Chris Berman, James Lipton, Kelly Clarkson and Andrew Zimmern. "We did a very heavy pre-vis for 'Two Worlds,'" explains Andrew Proctor, VFX Supervisor/Lead 3D Artist on the spot. "Phil [Joanou] wanted to get a fluid edit that switched between these two worlds. One side dark and moody, the other green and idyllic. This required multiple locations and meant the action had to be at exactly the same speed, so our edit would flow smoothly." Joanou and his team filmed in Mammoth, Lone Pine and Death Valley. "To create a sense of two worlds, we ended up replacing backgrounds with matte paintings," Proctor explains. "Some of the shots involved stacked plates. For instance, we shot plates of black mustangs running free, but we couldn't shoot them next to moving cars. We'd do a plate of the car and a plate of at least one horse. Then we tiled up one or two horses, and repeated. 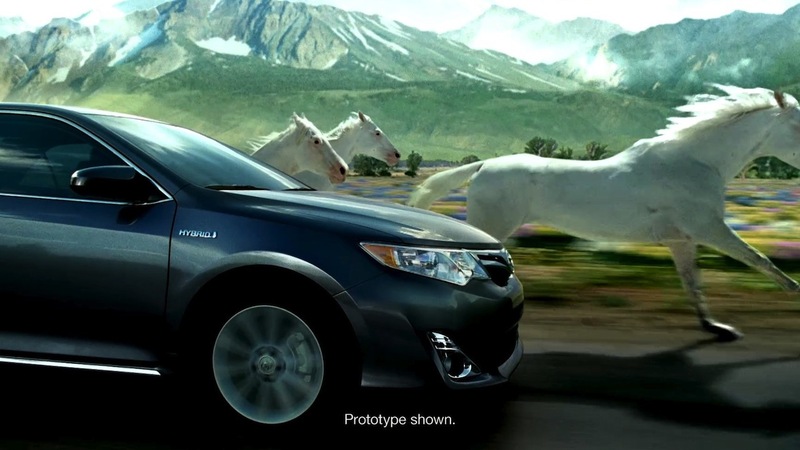 For the white horses, we shot the car practically and the horses in different locations. We used a similar angle, then composited and graded together. We then composited over the matte painting emphasizing the green lush organic world." "The wide shot at the end of 'Two Worlds' is intended to sum up the idea by combining both worlds in one image," explains Paul O'Shea, VFX Supervisor/Lead 2D Artist on the spot. "The challenge was to reconcile things that are supposed to be in contrast into one picture. The end shot is entirely CG. We based it on a camera move in a real shot but ultimately replaced everything in the scene. Things like the birds, the horses and the jets are enjoyable touches that echo the details found throughout the entire spot. Everything you see in the 'Two Worlds' vignettes is in the end shot, so it makes a nice summary." While the 'eco-friendly' world included a variety of atmospheric touches such as CG flowers, birds, mist and rainbows, the "performance-driven" world's flourishes included CG Jet fighters, dust and fog. Much of "Two Worlds" overall environment was created with sky replacements, road replacements, matte paintings, set extensions, heavy rotoscoping and multiple telecine passes. O'Shea adds, "Another part of the project that was quite nice was heightening the contrast between the locations, creating something based on reality but sweetened to the point of fantasy. For instance, we used photo reference the agency's art director supplied from his home village in Switzerland to make the rocks and the mountains more aggressive." "We've worked with Phil a few times now, and it's a very open process," both Proctor and O'Shea concur. "We're getting to a place where we can compliment his photography and collaborate with him to be a real creative resource."